After purchasing the toughest boots and bindings for skiing, you may want to believe that you are good to go; whether it’s for snowboarding or skiing or even working outside in the snow. But how safe does this leave your eyes? 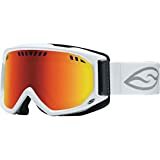 Ski goggles are there to protect your sight organs from wind, blowing snow, cold while still ensuring that the harsh glare of the sun on the white icy surfaces is regulated and only harmless long wave penetrates to reach your eyes. We have filtered through the dozens of types of ski goggles to present to you only the best. These picks will sure make you stand in the mountains for your exemplary performance and style. 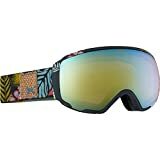 If you have some extra bucks to spend on a sleek pair of goggles, then this amazing pair of ski goggles is well worth the price. It is stylish, easy to change lenses, great range of use with an extra lens tint. A 5.5 base ARC extra wide, spherical dual lens has been employed specifically for optimal peripheral vision. Your lenses are safer and easier to switch thanks to the lock steady quick change system. The triple-layered Isotron face foam is built with DR-Force fleece and holds together well upon impact. Spy’s happy lens technology ensures a close-to-face fit and also features the solid anti-fogging technology. Among the priciest of the lot, but built flexible with innovative design and advanced technology making it worthy. There are a number of good features here, brilliant piece of glasses has a flexible faceplate and a rigid exoskeleton which pair well with the triple layer face form not just to ensure that it fits like you’d like it but for superb comfort too. F3 anti-fog layer has been applied to the dual vented lenses to ensure moisture is blasted out preventing cloudy lenses. The Plutonite lenses are quick to block any UV light trying to reach your precious eyes so they are taken care of. There is switch lock technology to thank for being extremely easy to use but tight. Skiers with a small face may want to consider the kid’s section as the company only offers medium to large sizes. This is a great all around goggle for eyeglass wearers; it is stylish, rarely fogs and can be worn over most glasses. You skiing adventures should be as colorful as they’re exciting and the Smith Optics Scope goggles are a good reason why. Glasses wearers who’ve been lucky to use this piece compliment the anti-fog coating for the excellent job of ventilating smoothly, wicking moisture so that you have a cloudless and clearest view down the slopes. Behind the lens, multi-density face foam has been perfectly fitted so that it is as tight as it is comfortable. Think we are done? Not yet, elements of Mother nature as such as harmful UV radiations have no chance of getting to your eyes, they’ll are quickly repelled. 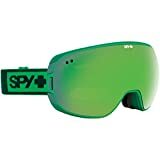 The manufacturer offers a wide assortment of vibrant color combinations so you can match your goggles to your skiing gear. This is the most awesome combination of desirable qualities you can find in one pick. To begin with, the anti-fogging features, for which they are primarily made for, are excellent. A clip-lock is effective at swapping between lens colors to match and adapt to the changes in weather conditions. The company uses Expansion View Technology (EXV) to achieve an unmatched field of view and maximum clarity. The frame is crafted from a tapered material with frameless zones all in an effort to accommodate the wide spherical lens so that the peripheral vision is amazingly broad. It is a good all-around lens with a good field of vision and great optics at a middle price-point. When it’s bright and sunny, this skiing eyewear will block out light and glare. When the clouds roll in and the slopes are left soaking in fog, the anti-fog treatment coupled with outlast fog management face fleece are effective at keeping fog out of your view. Anon is generous enough to offer a spare gray bird lens, nylon compression molded case and a micro-fiber carrier bag for user convenience. Additionally, the lens is spherical and incorporates ICT (Integral Clarity Technology) to achieve the wide, clear view every skier desires. If what you want is a ski goggle that is comfortable, protects against UV protection, easy to change lenses and comes helmet-compatible, then wait no more, get a piece. For absolute zero fogging issues while skiing in bluebird skies or during annoying white-outs or flat light, go for the smith optics scope goggles. The ultra-wide, cylindrical dual lens enhances airflow ventilation and so will not fog even once. You can use them with helmets so you won’t have to worry about the rest of your head. With every purchase comes included a microfiber bag for carrying your goggles around with you and replacement lens sleeve. To cement the greatness of these goggles, the manufacturer offers a lifetime warranty. What an amazing way to cover your vulnerable eyes while soaring the slopes. This ski goggle has left a mark as the most preferred eye gear for teenagers and pre-teens. Oakley found it wise to come up with this childishly attractive goggle to protect cover your adorable young one while out skiing. First of all, the price is just unbelievable. At a cost of below $20, you are guaranteed of what seems to be little to match for what it costs. In addition, a premium anti-fog coating inner lens ensure there is no moisture build so that you view is as clear as can be. The double lens features a Bolle design that ensures no temperature interference to limit condensation, this adds to clarity. You’re assured that your child will totally love this. You should give this pair of goggles a try today and you will realize just how much you have been missing. It is made of plastic so it is weightless and durable with an accompanied band creatively marked with the company logo. The manufacturer chose not to limit the expansive lens with a frame so that the peripheral view is limitless as well. What these goggles have instead is a lens sub-frame that’s been made to make lens changing fast and easy. Worry not about UVA, UVB, UVC and any other type of natural UV light there is, the Platonize lens material got you covered. The Bolle gives a free storage bag too. A decent choice considering the much it has to offer. Skiers who want a maximum field of vision with a minimum frame should consider this option. Within this magnificent piece of sunglasses, you’ll encounter the most appealing technological features unlikely to be found in the majority of products available in the market. The lens is large and frameless for a greater peripheral field of view. As you’d expect from such a top quality product, it is anti-fog treated and works to repel UV400. The OTG (Over-The-Glass) design allows you to use your glasses or helmet with the goggles. The best part is, this unit is compatible with more than 20 different lenses so it is limitlessly customizable. Of course, the extra lenses come at a fee. What comes free is a protective case and a carrying pouch and you’ll get a 1year warranty. It is great for you and still perfect for your teenage child. Considering the fairly reasonable price, it is great value for your hard-earned money. Size: the size of the ski goggles will determine the type of fit. Because skiing may last for quite a while, you’ll need a size that is comfortable and won’t obstruct your peripheral view. The size also determines whether or not they will be compatible with helmets. Select a size that won’t leave any gaps between the foam and your face and won’t slide back. Type of lens tint: changing the tint of the lens ensures that you get the same clear view in different conditions. You get to choose from the yellow, pink and blue if you intend to go skiing on flat light days when it difficult to see. During those brightly lit days, use the darker mirrored lenses. Design: spherical lenses offer improved peripheral view so you may want to incur the extra bucks they cost for this. Ski goggles with interchangeable lenses are well-liked as if you intend to use them for different weather conditions and still get optimal results. 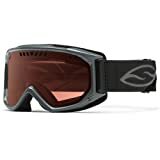 Price: some people may be willing to shell out three figures for skiing goggles but if you’re not’ consider a modest price range you will be comfortable with. Now you can go ahead and choose one of these top brands and you’ll be assured of unsurpassed performance and top-notch safety standards. 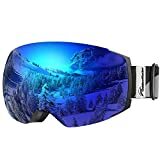 Given this list of the Top 10 Best ski Goggles; you can never go wrong in your selection process. Be sure to pick one which best fits your face!